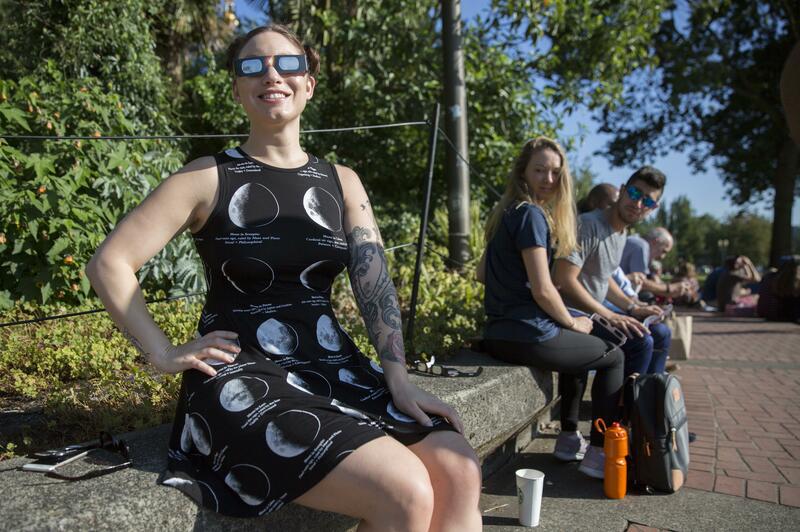 LINCOLN CITY, Oregon – Through the weekend, bartenders, ice cream vendors and restaurant owners waited for the crowds of eclipse watchers who were supposed to descend on the beach community here. But it was almost as if no one came. Locals called it a “ghost town” and traffic on U.S. Highway 101 flowed smoothly. There still were vacant hotel rooms Sunday evening. Monday morning about an hour before the eclipse began people wrapped in blankets began walking down to the beach. Some lit small bonfires, others trotted in spot trying to keep warm in the cold haze. Ruby Beebe, 8, road down from Seattle starting at 1 a.m. She was still in her pajamas, eating a breakfast sandwich with her dad Nick Beebe at 8 a.m.
“We couldn’t believe there was no traffic on I-5, nothing,” Nick Beebe said. Ruby Beebe said she fell asleep in the car and was now just excited to see the eclipse. Many locals stayed off the beach in the morning, knowing that fog would make eclipse viewing nearly impossible. But Sisters Rebecca Simpson and Karen Whalen, who came all the way from Kentucky, remained optimistic. Lincoln City locals migrated to higher ground as soon as it became obvious the beach fog wouldn’t lift. The hillsides around Devil’s Lake – barely a mile inland – were sunny and provided plenty of great view points. People cheered as the eclipse became total, the lights from cellphones dotting the suddenly darkened lawn. Then, just like that, the earth turned and the sunlight came back and the street lights turned off again and it was all over. And that traffic no one had seen all weekend? Streets became jammed as eclipse viewers fled the town. Published: Aug. 21, 2017, 5:16 p.m. Updated: Aug. 21, 2017, 11:27 p.m.